For the Earth to be in equilibrium, solar radiation incident on the planet should be equal to the radiation lost by the planet. The radiant energy remaining in the Earth's surface-atmosphere system is then available to support a climate conducive to life. The energy balance should be achieved at the top of the atmosphere and at the surface. In the former case, the balance involves the exchange of radiative fluxes only, while in the latter sensible and latent heat fluxes must be added to radiative fluxes to maintain the energy balance, that is to say that the gain of radiant energy by the surface is countered by the transport of sensible and latent heat fluxes out of the surface. Sensible heat is the energy transferred between the surface and the atmosphere when there is a difference in temperature between them. Latent heat is the energy required to evaporate water. Figure 2 The Earth's annual global mean energy budget. Values are globally and annually averaged fluxes in units ofWm-2. 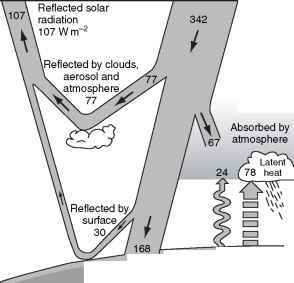 The left side of the figure shows the fate of solar radiation in the Earth's surface-atmosphere system, while the right side depicts the processes (emission and absorption) governing the longwave (IR) radiation. Thermals and evapotranspiration illustrate the contribution from sensible and latent heat fluxes, respectively. From Kiehl JK and Trenberth KE (1997) Earth's annual global mean energy budget. Bulletin of American Meteorological Society 78: 197-208.
observations. At the top of the atmosphere, incident solar radiation is about 342 W m~ , or one-fourth of the solar constant. This is because the cross-section area at which the Earth intercepts the solar flux is na^, but the area of the spherical planet is where ae is the radius of the Earth. Taking the planetary albedo of 30%, c. 235 Wm~2 (or 70%) is available on average to warm the atmosphere and the surface. Of this, about 50% is absorbed by the surface. In turn, the longwave radiation emitted by the Earth's surface is about 390 W m~2 that is far larger than the amount of solar radiation absorbed by the surface (168 Wm~2). This stresses the importance of the atmosphere as a thermal blanket that keeps the surface warm. The major fraction of the surface longwave radiation is absorbed and re-emitted by the greenhouse gases and clouds (and to a lesser extent by aerosols) at lower temperature. This emission returns c. 324 Wm~2 back to the surface, whereas c. 235 Wm~ of terrestrial radiation is lost to the space. Only a small fraction (40 W m~ ) of surface-emitted radiation is transmitted through the atmospheric window directly to space, considering the global cloud cover of c. 62%. Thus while the absorbed solar radiation provides the source of energy, the thermal IR plays a major role in the redistribution of the radiant energy within the atmosphere and between the surface and the atmosphere. Globally, latent heat releases from the surface about three-fourths (or 78 W m~2), and sensible heat one-fourth (or 24 W m~ ), of the annual mean radiant (shortwave and longwave) energy absorbed by the surface. 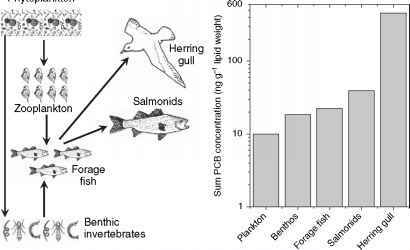 Ecosystems exert a major influence on the partitioning of the energy between sensible and latent heat. The presence of vegetation tends to increase latent heat fluxes relative to sensible heat fluxes. If there were no latent and sensible heat transfer, the Earth's surface temperature would be much higher than the observed value of 288 K.
Examination of the global radiation balance reveals a vital role of the atmospheric composition and the surface in controlling the climate of our planet. Any changes (natural or human induced) in gases, aerosols, clouds, or the surface has the potential to alter the radiation balance. Anthropogenic changes in CO2 concentrations and in aerosols (especially, carbonaceous and sulfates) have been suggested as the important global climate change drivers.